Situated in the Bagalkot district of Karnataka, the temple town of Badami is one of the well known tourist attractions of India. The reason for this is not far to seek. 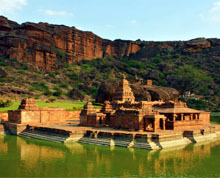 Badami was once the regal capital of the powerful kingdom of early Chalukyas or Chalukyas of Vatapi as they are called. Badami is famous for several temples constructed by the Chalukyas of Vatapi during the sixth-seventh century A.D. Some of these are magnificent rock-cut cave temples, while others are structural. During the Chalukyan times the temple architecture reached its zenith. The early Chalukyas had made their mark in history as prolific builders. The Chalukyas of Badami rose to power in much of Karnataka and Andhra Pradesh in the middle of the 6th century AD. The Chalukya dynasty was founded by Pulkesin I, who signalized his accession to power by the performance of the Vedic horse-sacrifice. He was succeeded by his sons, Kirtivarman I and Mangalesa, who extended the empire in all directions and the Kalachuris of northern Maharshtra and Malwa were forced to surrender. The Kadamba capital was finally reduced by Pulkeshin II (609 -642), son of Kirtivarman, the greatest king of the line. He was an approximate contemporary of Harsha of Kannauj, one of the greatest Indian rulers, whom he defeated on the banks of the Narmada river thereby checking the advance of the northern ruler to south India. This event has been referred to with pride in the Chalukyan inscriptions of later years. The Chalukyas of Badami are also known as early western Chalukyas who rose to power in much of Karnataka and Andhra Pradesh in the middle of the 6th century AD. Pulakesin II ascended the Chalukya throne after the death of Manglesh, brother of Kirtivarman (father of Pulakesin II). An intrepid warrior, he is said to have made an onslaught on the neighbouring kingdom of Pallavas whose ruler Mahendravarman I was forced to cede the northern parts of his kingdom to him. He reduced the Kadamba capital of Vaijayanti. He brought Pishtapura in the Godavari district under the dominions of his empire. 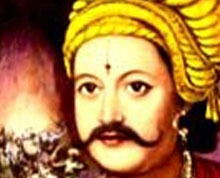 His younger brother, Kubja Vishnuvardhana, was made governor of the province. The Chalukyan king also used to have a navy which he employed to besiege Puri, not far from the modern Mumbai. During the reign of Pulakesin II, an army by the Arabs was sent to Thana near Mumbai in about AD 637. He is said to have entertained the envoy from the king of Persia. However, there is no unanimity among the historians on this. The last days of Pulakesin II were far from happy. The Pallava king, Narasimhhavarman I, son and successor of Mahendravarman I, avenged the defeat of his father by destroying the Chalukyan capital Vatapi and assumed the title of “Vatapi Konda" (the Conqueror of Vatapi) to commemorate his victory against the Chalukyas. Pulakesin II died in AD.642. 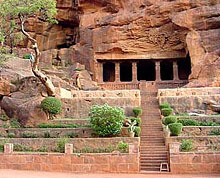 Carved out of the hill opposite the Badami Fort, the four cave shrines were excavated on the instruction of Chalukyan ruler Mangalesa. These rock-cut cave temples are dedictated to Vishnu, Shiva and the Jain Tirthankaras. These four temples along with a fifth Buddhist cave shrine are situated about half a kilometer from the Badami town. 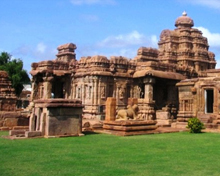 Bhutanatha group of temples, Badami Fort, Archaeological museum are other attractions in Badami. Hotel Maurya Chalukya, Hotel Badami Court, Hotel Mookambika Drive, Laxmi Vlilas Hotel and Hotel Ananda Deluxe are some of the hotels in badami. Karnataka State Transport Corporation runs buses from Badami to Bangalore, Bagalkot, Belgaum, Bijapur, Hospet and Hubli . Though nearest railhead is Badami, 4 km from Badami town, on the Sholapur -Hubli metre-gauge line, convenient railheads are Hubli and Bijapur which are 130km and 132 km from Badami. The nearest airport to Badami is Dabolim in Goa which is 290 km away. Dabolim is connected to other important cities of India by flights. During the Chalukyan times the temple architecture reached its zenith. 44 km from Badami, Aihole is another place which was previously capital of the early Chalukyas. Pulkesin I moved his capital from Aihole to Badami. Today Aihole, considered to be cradle of the Hindu temple architecture, is a famous travel destination on its own right thanks to its vast assembly of cave temples. The place is home to about 125 temples divided into 22 groups. Durga temple is the most famous of the temples in Aihole. Ladh Khan Temple, Surya Narayan Temple, Gauda Temple, Kondi Group of Temples, Maguti Temple, Hucchimalli Temple and Ravanphadi Cave are other attractions in Aihole. A detailed record of the long reign of Pulkeshin II ranging from AD 609 to 642 is preserved in a contemporary document, viz. the Aihole inscription dated 634 AD., written by his court-poet Ravikirti. No hotel is available at Aihole. Hence it is advisable to stay at Badami or Bagalkot which is 34 km away from Aihole. Best time to visit Aihole is from October to March. Regular buses connect Aihole with Badami. 22 km from Badami, Pattadakal is an alluring destination for tourists for its awe inspiring chiseled temples built by the Chalukyas in the 7th and 8th centuries AD. Located on the banks of the Malaprabha River this World Heritage Site is home to several temples including Virupaksha Temple, Sangameshvara Temple, Chandrashekhara temple, Mallikarjuna Temple, Khadasiddheshwara Temple, Jambulinga Temple and Galaganatha Temple. Of these, Virupaksha Temple is the grandest of all. No hotels are available at Pattadakal. Hence, it is advisable to seek your accommodation in Badami. Regular buses connect Pattadakal with Badami.